Mike Barber photographed the Stop The Cuts rally against Rob Ford's austerity program in September at City Hall. Paul Kellog photographed a rally in solidarity with the Egyptian Revolution. 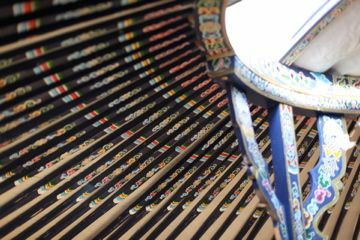 Krystyna Balaban photographed the Yurts at Occupy Toronto and produced a video of their construction. 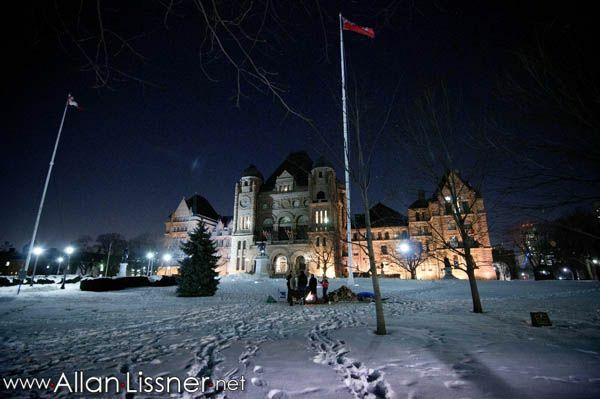 Allan Lissner braved the bitter cold to photograph Algonquin Firekeeper Daniel Amikwabe Bernard and supporters as he kept a vigil and sacred fire outside Queen’s Park to in response to logging in the South March Highlands of Ottawa. 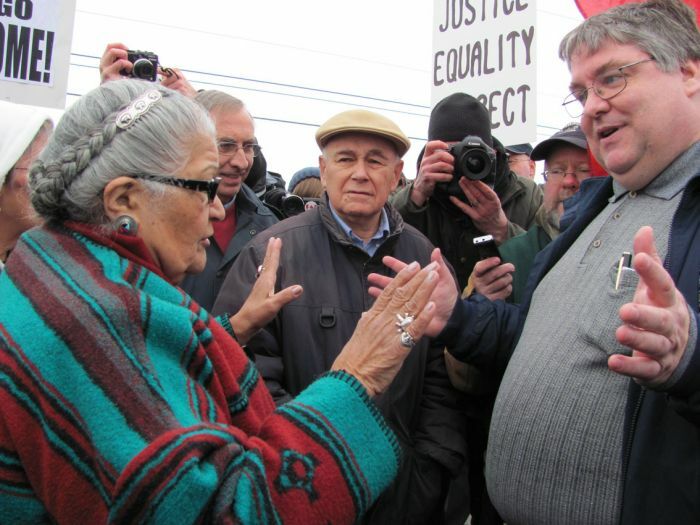 Deb O'Rourke photographed 6 Nations people and allies challanging Gary McHale and Niki Thorne took a video of the same. 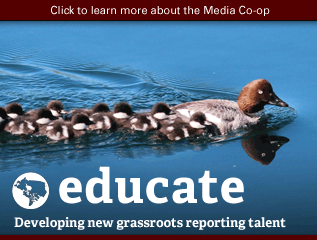 The independent journalists at the Toronto Media Co-op (TMC) have put in another year of passionate work covering important stories from our city and internationally. 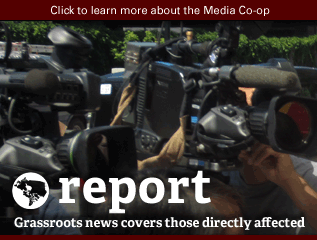 This year we continued our coverage of the G20 aftermath, kept on the pulse of the movement against Rob Ford and had a team of reporters and videographers covering Occupy Toronto. 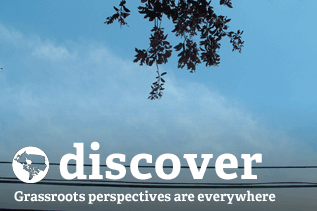 We are proud of everyone who contributed articles, photographs and videos to TMC this year and are happy to highlight some of our best coverage from 2011. In the early days of January, Saira Peesker covered Rob Ford's attack on public transit with the article As clock ticks on city budget, activists campaign to save Transit City. We continued our coverage with a piece by Justin Saunders that took a look at the system that elected Ford, Passing The Post: Prospects for Municipal Voting Reform. 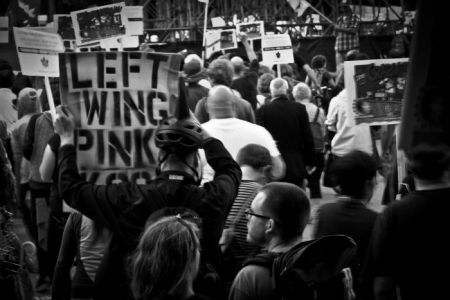 Later, Mike Barber’s photo essay of September’s Rally Against Austerity followed the burgeoning Stop the Cuts coalition. TMC intern Mairin Piccinin wrote about the ugly side of local politics in Islamophobia goes to school in Toronto, which detailed an attempt by religious extremists to ban Muslim students at Valley Park Middle School from praying in the cafeteria. In February videographer Niki Thorne covered a farcical 'Truth and Reconciliation' rally in Caledonia/Six Nations called by Gary McHale, where anti-racist supporters of Six Nations outnumbered McHale’s right-wing forces by a factor of 10 to one. Allan Lissner braved the bitter cold to photograph a Algonquin Firekeeper Daniel Amikwabe Bernard and supporters as he kept a vigil and sacred fire outside Queen’s Park in response to logging in the South March Highlands of Ottawa. Megan Kinch's article Protesting Barrick Gold, Gaining Momentum followed activists and indigenous leaders locked out of Barrick's Annual General Meeting in Toronto, as they brought attention to human rights and environmental justice violations related to the international mining giant. In June, Carmelle Wolfson produced a two-part series of interviews with passengers on the Canadian boat to Gaza, the Tahrir, who challenged Israel's naval blockade with a shipment of medial supplies. Although the G20 packed up and left Toronto almost 18 months ago, activists are still dealing with the fallout. Alex Hundert blogged about his own experience of judicial perseuction for organizing resistance to the G20. Tim Groves reported on the arrest of independent journalist Dan Kellar for naming undercover officers who infiltrated the activist groups he was a member of. Groves, along with Martin Lucas, broke an investigative story on RCMP spying on protesting First Nations, based on research from reams of documents obtained through freedom of information requests. Groves also was instrumental in releasing what has become known as the G20 Papers, which is available for download on the Media Coop site and has spawned a number of articles since being made public. On the arts and culture front, Jonah Hundert's review of “You Should Have Stayed Home” mixed his personal analysis as a former G20 prisoner with the artistic merits of the SummerWorks play. In the always opinionated blog section of TMC, Ajamu Nangwaya argued that “Black History Month” should really be called “African Liberation Month”, while the irrepressible blogger ‘Frida Press’ critiqued the Stonewall ‘alternative’ Pride march in the article Stonewall TO: Never Again? 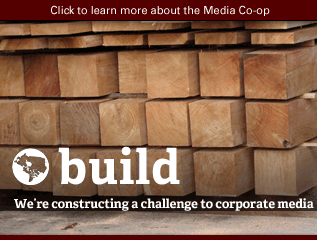 Gwalgen Geordie Dent put together the fantastic Media Co-op Investor series, which profiled a number of influential companies and demystified the stock market. In March, Dent wrote “We Check Out the Assets of Brookfield”, the company which became famous for owning Zuccotti Park - the epicenter of Occupy Wall Street. In 2011, the Toronto Media Co-op continued our tradition of print journalism with ‘The Spoke’(the broadsheet founded to cover the G20 protests), and we hit the ground running at Occupy Toronto with a brand new publication “99: Dispatches from Occupy Toronto”. Inspired in part by the Occupied Wall Street Journal, 99's circulation eventually reached over 1500, distributed in St. James Park, online and in neighborhoods. Contributors included TMC journalists, Occupiers and community organizers. 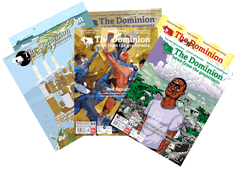 Issue #6 covered the eviction threats to Occupy Toronto. 99 was present from the start of the occupation of St. James Park to the very end, and not just in print. 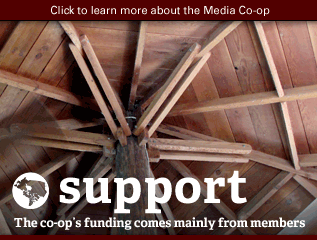 One of the best TMC videos of the year was Krystyna Balaban's piece on Yurt-building at Occupy Toronto. Deb O'Rourke covered the saga of Occupy Toronto going to court for an injunction to stop the eviction by the City, asking "Who is the public?". Meanwhile, Toronto Media Co-op investigators dug through the archives to determine who owned the land of St. James Park, forcing the Anglican church to pick a side instead of claiming they weren’t sure if they owned the Eastern end of the park. 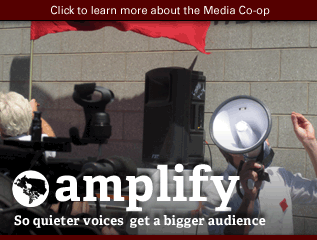 Media Co-op reporters had live coverage of eviction threats and the eviction itself, with reporters from the G20 Alternative Media Centre and other major protests. Also begun this year was Toronto In Review, a periodic roundup of Toronto news of interest to the left from both mainstream and alternative sources. Toronto in Review is written during our regular Monday story meetings. 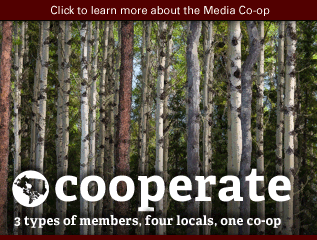 The Media Co-op is owned by its members, readers and contributors. 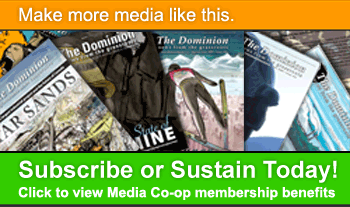 If you’d like to become a supporting member of the media co-op, you can sign up here to become a reader member and contribute financially to the TMC’s ongoing work. If you are interested in contributing content, you can set up an account under our open publishing model. 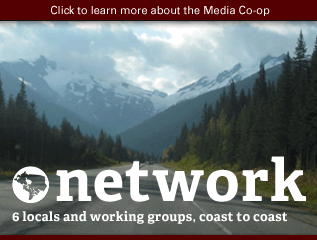 If you want to become more involved, we have story meetings for contributors (writers, videographers, photographers, volunteers) every Monday at 6:30 at the Linux Caffé at 326 Harbord Street. That's all for this year, folks; we hope you'll join us again in 2012 for the best independent journalism that Toronto has to offer.